Bathroom safety should be at the forefront of your mind year round. Is your bathroom as safe as it could be? 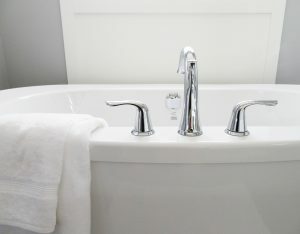 Consider these five low-cost items to make your bathroom safer. Non-slip bath mat: All that water in the shower or tub floor makes bath time very slippery. A fall could result in hitting your head or another injury. Adding a non-slip bath mat with suction cups to hold it in place is an inexpensive addition that prevents accidents. Shower curtain liner: It may seem more like an anti-mess device, but shower curtain liners also improve safety. Think about it – if the bathroom floor is wet, it’s not just messy; it’s a safety hazard that makes you prone to slipping and electrocution. Be sure to clean the shower curtain liner occasionally to prevent mold growth that could become a health hazard. Non-skid rugs: Nothing beats the soft, comfortable feel of a fluffy rug beneath your freshly washed toes. Careful, though; if the rug is two-sided and therefore slides around easily, you could end up losing traction when you step out of the shower. Replace two-sided rugs with the non-skid variety to get around the bathroom with confidence. Shower shelving: A variety of inexpensive additions allow you to store toiletries off the shower floor. Make sure you choose a sturdy, stable shower shelving option since the last thing you need is for slippery suction cups to lose their grip while you’re showering and cause everything on the shelves to come tumbling down. Install the right safety upgrades to prevent bathroom hazards.